You know only too well how I keep on going on about FlatCam and milling printed circuit boards on the Tormach PCNC440. You will also have read about my preoccupation with trying to hold the PCB material flat to avoid variations in milling depth. 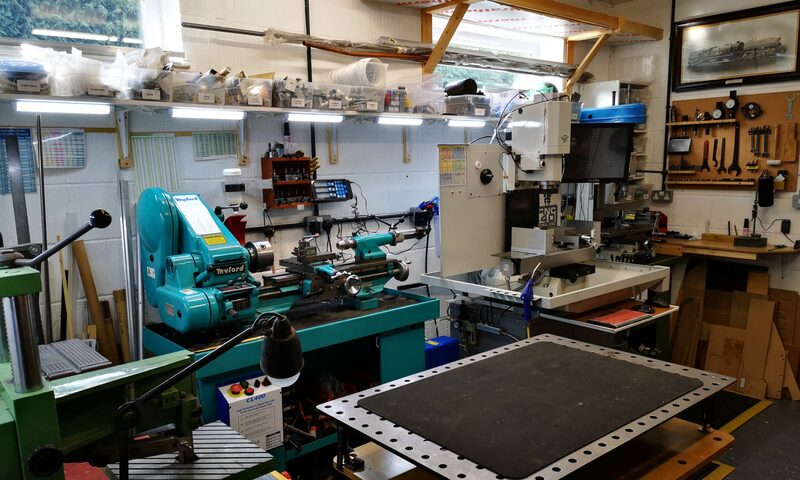 I have got it to a reasonably repeatable process using mechanical clamping but you know when a perfectionist starts something it has to be as good as possible …. step forward the Vacuum Clamping Table. The thinking for this followed on from the Rosebud Grate experiments on my live steam locomotive. The grate consisted of a matrix of larger holes on the underside of the grate leading to a small bore hole on the top side of the grate. The theory as I understand it was that the reduction in size creates a Venturi type effect and boosts the air stream into the fire. I wondered therefore if I reversed the air flow i.e. sucked the air from the large hole into the small hole whether this would be beneficial in providing a boost of the suction. It is a bit tenuous I must admit and I can’t point to lots of science to back this up, but certainly worth a play. 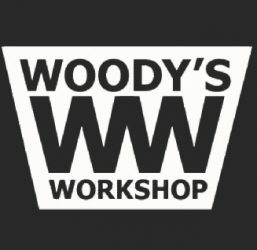 First stop was Fusion 360 and a two part plate was designed. This consisted of a top and bottom part. 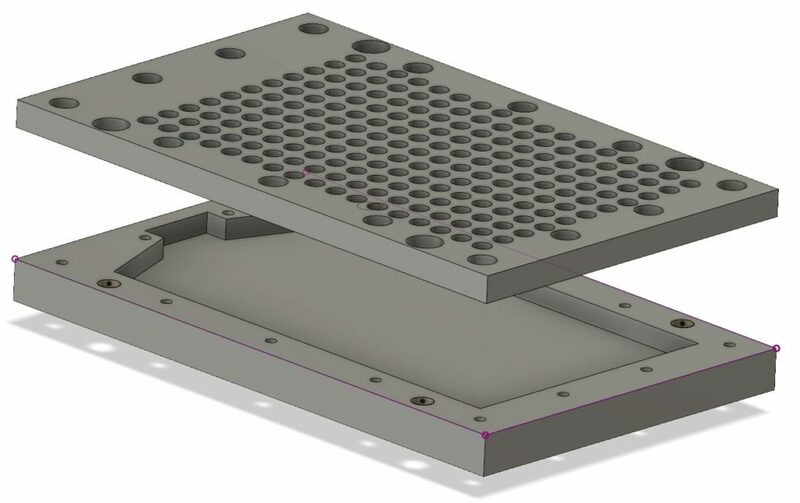 The bottom part is 15mm cast aluminium with a milled trough and the top plate is 10mm cast aluminium with 6.8mm holes (no science – this is tapping size for M8 that was already in a Tormach collet) on the top side that reduce down to 1.3mm holes (ditto also already in a collet) as breakthrough holes on the bottom surface. Around the edges are M6 screw holes to clamp the two plates together and also M8 mounting holes to fasten the plate to the tooling plate on the Tormach. I didn’t quite think the suction connection fully. After I had worked out the total area of the 1.3mm holes I realised that to accommodate this I needed a 16mm diameter hole for the air inlet. This was not going to be possible to mount on the 25mm overall edge of the plate. 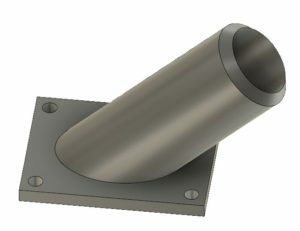 The solution was to 3D print a connecting pipe and mount this on the top surface. This adapts to the vacuum cleaner pipe being used as the suction source. The 3D printed adapter did not provide a good seal to the top plate so I had to fit a rubber gasket on it. The parts were all put together as shown below. To my amazement it seems to work ! There does not seem to be leakage on the joint between the two plates and the vacuum pipe adapter with the rubber gasket seems to seal alright. 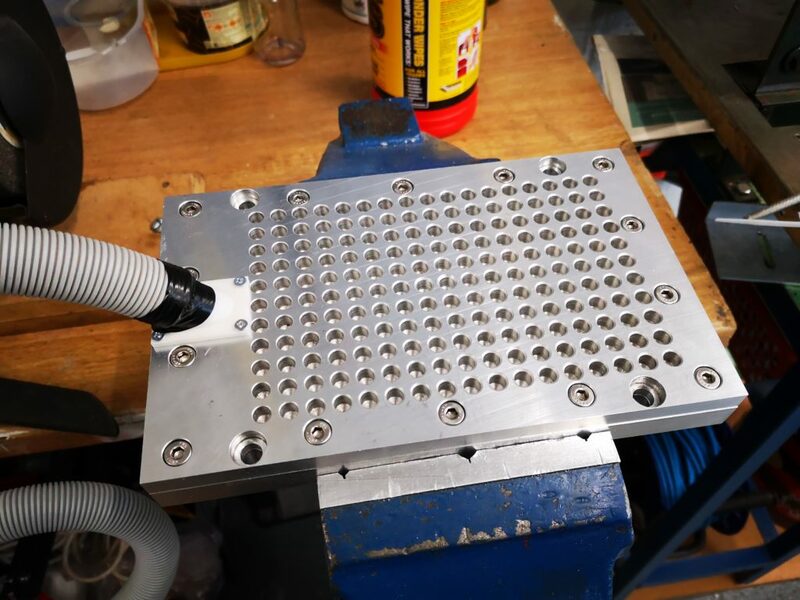 If I put a large piece of PCB material over all the holes it is very difficult to move it. Single sided board is naturally bowed in the manufacturing lamination process and I can see it visibly jump flat when I turn on the vacuum. 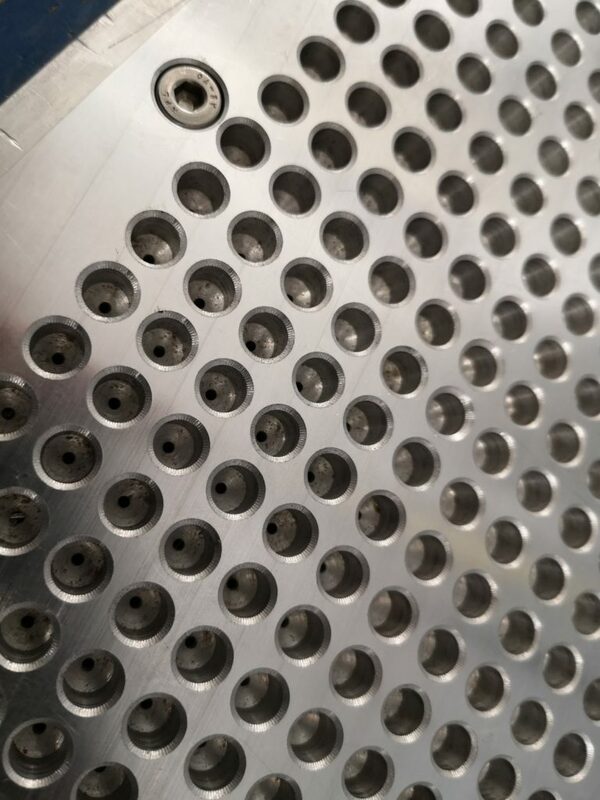 If the PCB is smaller than the total area of suction holes it does not seem to matter about covering over the ‘non-used’ holes to maintain the grip. Proof will be when I try to run a board. The milling process will not have major sideways pressure as the depth of milling is quite small so it should be fine. Clearly I can’t go drilling the component mounting holes in the PCB material with this holding technique but I can spot drill them to say 1mm depth and then finish them by hand having got a guide hole to start me off. But all this will have to wait as the X axis limit switch has come apart on the Tormach and a spare has been ordered and is on its way.